The Yakuza franchise is one that has fascinated me for some time, but I never dove into it until the promising Yakuza 0was released. 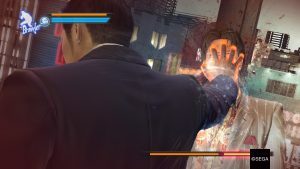 This game promised to be a great introduction to the Yakuza universe – newcomer-friendly and filled to the brim with side activities as well as a detailed series of storylines. Having invested many, many hours into the serious but also often wacky universe of Yakuza 0 I can say that the game delivers all of that and more. Yakuza 0 is a prequel to the main series of titles. 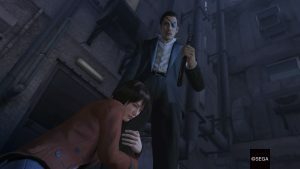 It features separate storylines looking at how Goro Majima and Kazuma Kiryu rise to infamy as they navigate the perils of Tokyo on the wrong side of the Yakuza they once called family. The game alternates between the characters every couple of chapters and allows you to play as each character as you explore their very different lives and experiences. Kiryu is an up-and-coming Yakuza who is framed for murder and forced to make hard decisions as he walks away from the only family he knew. Majima is also ex-Yakuza but is allowed to be free; he runs a cabaret called the Grand as a way to pay back his previous debts to the Yakuza. Both characters get involved in situations larger than themselves. At the heart is a real estate venture that is incredibly contested in Tokyo. 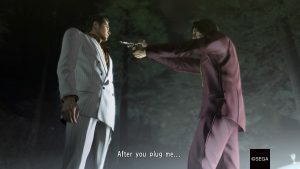 Majima and Kiryu also get business interests in their regions, which puts them at odds with other underworld figures who are competing for the same resources. One of the things I enjoyed most about Yakuza 0 is how the game effortlessly flips between the frankly deadly-serious storylines of the two main characters and the often silly side quests and mini-games. The core game is deep enough with its varied fighting mechanics (more on that later), depth of mission types, and storylines that are a joy to discover, but the extra stuff is so very good. Everywhere you go there are people with problems. Sometimes it’s a little girl who wants stuffed animals, other times a weird guy who wants to cross a bridge in a controversial jacket; in all cases they need your help. What I liked about these side missions is that they show a softer side to the two heroes. These are men who crack necks and break bones without breaking a sweat, but when you stumble on a crying child they have the best reactions and dialogue with them. All of these missions are completely optional, but they have instant rewards and additional perks when you start your businesses, so not only are they entertaining and add depth to the characters, they confer deep bonuses too. There are also heaps of mini-games: Disco Dancing, Darts, Pool, Bowling and Sega arcade games to name a few. They all play very differently and are uniformly incredibly entertaining. The Karaoke is by far the most hilarious, as midway through the song your imagination takes over and you end up starring in a music video. The mini-games also confer monetary bonuses and further benefits when you play locals in tournaments. What impresses me most about these diversions is how amazingly well they are constructed. Pool feels like a true pool simulation, Disco is a fast-paced rhythm game, and Karaoke is an even faster-paced mini-game with tons of graphical flair and polish. For simple diversions these games add a whole lot of depth, as well as silliness. Just look at my video on the Dancing and Karaoke mini-games to see how crazy they get. 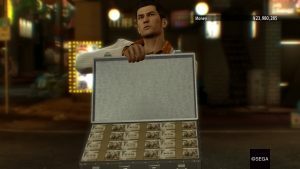 While there are a lot of side quests and mini-games with different mechanics, the combat in Yakuza 0 is the true star of the game, and there is a depth to it that keeps scaling as the game progresses. Both characters learn a variety of martial arts styles (sometimes in veryunconventional ways) and you can switch between the styles at will during the many fights you get involved in. The styles can be upgraded with extra moves and techniques by spending money you gather. Each style has its own ability screen and can be upgraded independently. This results in a huge variety of options when battling your enemies. Some styles are defensive, others are fast or aggressive, depending on what is needed. The result is a very satisfying deck of options when combat is engaged, and it comes in handy as you will fight a lot. From roaming bad guys, to bullies on the street and thugs in your way on missions, all the way up to boss battles, you will need to fight with all your skill to survive. Some fights are relatively easy, others are with large groups or powerful bosses, but in all cases it will be enjoyable. Have a look at a Let’s Play I did looking at the game and its fighting system. 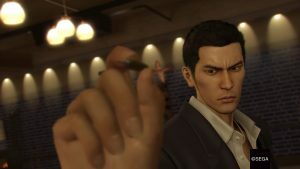 Yakuza 0 could have been an unmitigated disaster, with all the different game types and fighting styles, the mix of serious and silly elements, and the multiple storylines. 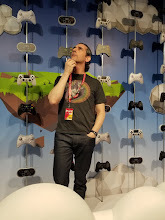 But the developer found a way to distill all of those pieces into a cohesive and enjoyable experience. The storylines are dark and brooding at times, but in many ways also very human and real with emotional and physical conflicts that resonated with me. The side quests and and silly stories added a surprising depth to the characters and showed the odd (at least to this westerner) cultural differences between the West and Japan. All in all Yakuza 0 is a fantastic experience featuring characters I grew to truly care about and a host of diverse but engaging experiences and systems that pulled the game together in a way that truly surprised me. This is a great entry point into the Yakuza universe and just a great game in general.